Home Home + Garden Think You Want to Keep Bees? Try Fostering a Hive First. Think You Want to Keep Bees? Try Fostering a Hive First. The buzz on raising bees. Our August 2016 issue features a guide to homesteading, including hydroponics, foraging, composting, bee keeping, alpaca herding, and a myriad of other ways to get your hands good and dirty. Maybe the first step to raising your own hive of honeybees is to realize that they, like us, are profoundly social animals. So social, according to Carlier Smyth of Queen City Bee Co., that they groom one another, and when one dies it can change the behavior of bees nearby. 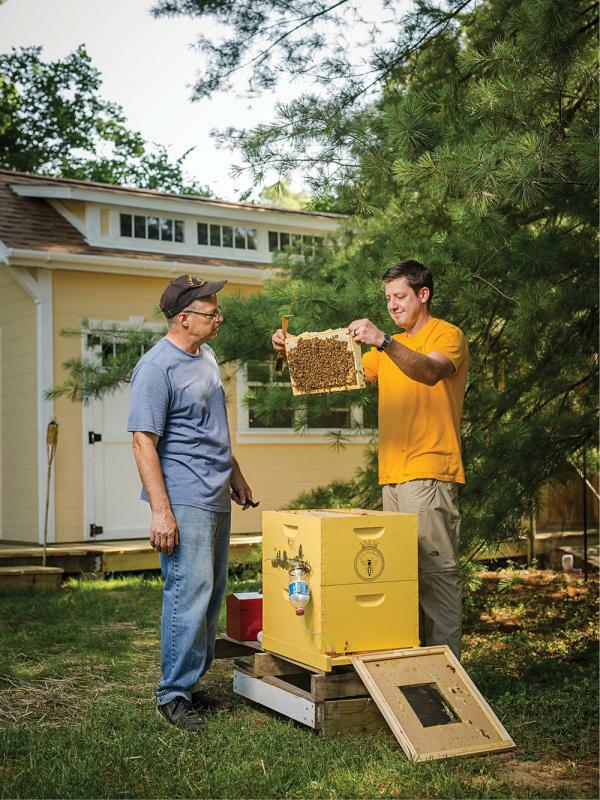 Queen City Bee Co.’s Carlier Smyth (right) checks on Paul Wilson’s foster hive in Madeira. A good way to access the hive-mind is to start as a foster parent, taking a loan hive from Queen City Bee Co., and paying attention during the biweekly visits from the expert who will talk you through what needs to happen next. This way you can learn to keep bees without incurring a monetary hit—and without endangering the bees. Plus, you get to keep what they make in your yard, so the perks are all there. The foster program is a good way to connect with others on the bee list. “I don’t like calling it a club, but among other foster parents you can build relationships and suddenly you’ve got a network,” says Smyth. The foster program helps you deal with Cincinnati winters, too. Nationally, 50 percent of hives can be lost to cold weather, but he says you can preserve 90 percent or more of your bees if you plan wisely. Queen bees, like Queen Bey, like to get in “formation”: they wait for a critical mass of chambers before the queen decides the time is right for laying her eggs. “A bee colony will build in any space larger than 3/8 of an inch,” says Smyth. But you want to make sure the space in your frames is configured so that the colony expands in a condensed fashion that maximizes bee power. →Location is key: Make sure the hive faces southeast, allowing morning sunlight to get those bees moving and foraging early. →Recognizing swarming signs is essential—to keeping the peace with your neighbors, and to holding on to your runaway colony. →Coping with winter includes making sure there’s adequate honey and that hard candy Boards are available. →Build your frames so that the bees build a critical mass that encourages egg-laying by the queen. Previous articleHomer Bailey is back. And a bit peeved.